The International Necronautical Society’s founding manifesto declared an intent to map the spaces that open around the sign of death in the fields of literature, art, science and culture; to plot and to follow the paths that lead to these spaces. It also spoke of a ‘craft’: as the vehicle to be constructed, and as the practice to be identified and cultivated in order to realise the necronautical project. 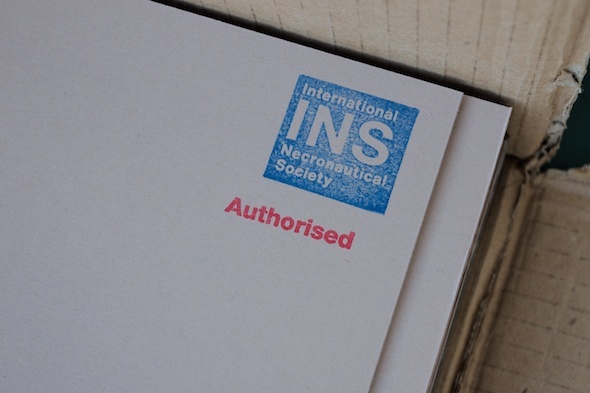 In 2001 the International Necronautical Society (INS) was invited to take up residency for two weeks in the Office of Anti-Matter (Austrian Cultural Forum, 21 March–4 April). There, INS General Secretary Tom McCarthy received and interviewed writers, artists and philosophers whose work engages themes resonating with the concerns of the INS. The interviews (with among others, Simon Critchley, Rut Blees Luxemburg, Margarita Gluzberg, Will Self, Mark Aerial Waller) were transcribed and are published online. Tom McCarthy’s report to the INS analyses and compares the depositions of his guests and suggests future directions for the INS.